Unlike anything else in the Denver/Boulder area, schedule a tour of The Studio (Boulder) to see what a difference the space makes when planning your event. The Studio (Boulder) is a dynamic creative space designed with an “industrial chic” aesthetic by renowned local artist Jen Lewin. The space functions not only for community collaboration but also as a gallery. 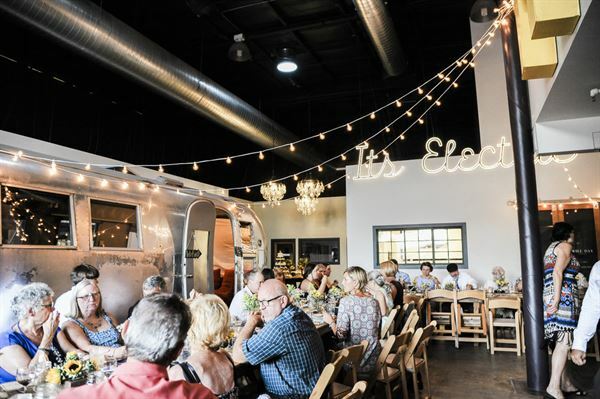 By keeping some of the raw, industrial elements of the space and combining it with high end finishes, natural light, art, a vintage airstream trailer and reclaimed materials the result is an old rustic feel with this very modern, industrial space. With more than 2,900 square feet of ADA accessible space for any event, you can relax and join the party! The Studio (Boulder offers a unique opportunity to entertain between 200 and 300 guests for a wide variety of coporate and private events in a verstile environment. Inside our vintage, remodled airstream trailer turned media lounge, find a VIP lounge available for use during events. Pimped out with a large, flat-screen TV perfect for looping videos, slideshows and movies or use the Chromecast feature to stream music, turn the lights low and set the mood for your guests. The outdoor patio features limited bistro style seating or bring your own to expand the possibiities! Open up the glass garage door on warm evenings and let the music out and the party enjoy the breeze! Bring a grill or call your favorite food truck to pull right up alongside the patio! The Studio (Boulder) is home to artists, makers, creatives and entrepreneurs. Enjoy our dynamic and rotating gallery from local artists or connect with our community to curate pieces just for your event. The unique industrial glam environment provides space for a DJ or a band, bring in a bar service or use the family style kitchen table to set up a buffet. Project off the mezzanine for speakers, videos or slideshows or stream music through our Sonos Wireless HiFi System. Consider The Studio (Boulder) a canvas for your creativity. Make it your own and host a dream wedding that's sure to stand out!